Welcome! Todays second lesson will be on both natures and EVs. They are both extremely important in the world of competitive battling and without the correct nature and EV spread you will be at a significant disadvantage. I will be going over how natures affect your Pokemon and also how to EV train your Pokemon. Natures are used to define a Pokemons "personality". They affect the growth rates of two particular stats. One stat will be increased by 10% while another will decrease the stat by 10%. While most natures will increase or decrease stats, there are 5 natures that will have no impact on a Pokemon's stats. A nature is randomly generated when it is encountered in the wild or when received as an egg. However, the nature that is passed down to the egg can be controlled, as explained in my previous article. The nature that works best changes for whatever style of play a Pokemon is best at. For example, a Pikachu benefits from having a increased speed stat, so a Timid nature works best as the attack stat is decreased, which we don't need. NOTE: For the following example, no EVs have been added. Even though this Pikachu has yet to be EV trained, it is already apparent how big a difference a nature can have on the stats of your Pokemon. A list of natures and their effects can be found here. Effort Values, EVs for short, are points that add bonuses to a Pokemon's stat, what stat gets a bonus depends on the Pokemon you are battling and the item you are using, if any. Usually a fast Pokemon, like Zubat, will give out speed EVs, whereas a Pokemon with high HP, like Gulpin, will give out HP EVs. While EV training used to be very strenuous, Gen 6 made it a lot easier, by not only speed up the original process, but by also introducing a new method which, while may take longer, is much simpler. I will go over both methods. It is important to remember that a Pokemon can only have 510 EVs spread throughout the Pokemons stats, with the maximum amount of EVs a Pokemon can have in a single stat is 252. The Power Items - You'll already have some from your IV breeding but I would advise getting at least three of each as it will speed up EV training a lot. They are available for 16BP in the Battle Maison. A Pokemon with Sweet Scent - Horde Battles are your best friend when it comes to EV training. Using Sweet Scent guarantees that you will enter a Horde Battle. Oddish and Combee are both very common and are likely to have Sweet Scent when you catch them. It is important to remember that Sweet Scent will not work in areas where it is raining. A move that will hit all Pokemon in a Horde Battle - While not overly important, this will speed up battles a lot. Moves like Surf, Rock Slide and Dazzling Gleam will hit all enemies. Pokerus - Pokerus is a virus that will double the EVs gained in a battle. Again it's not important, it will speed up the process too. Pokerus can spread between Pokemon but an infected one will become cured of it if it is outside the PC at midnight, even if the game is off. So it is always advised to keep one Pokemon with Pokerus in your PC at all times, only taking it out when you want to infect a Pokemon. Once Pokerus is gone, the cured Pokemon will still have the benefits. EXP. Share - Everyone will already have this but make sure it is on. This will make sure that every Pokemon in the party will gain EVs, even if it wasn't in battle. How Does Hordes, Power Items and Pokerus effect EV Training? All of these items help speed up the EV process. Say if you only battled a single Zubat to increase your speed EVs, you will need to battle 252 Zubats in order to get a maximum speed stat. Now that is a lot of Zubats! Horde Battles mean that since you fight 5 Pokemon like Zubat at once, you will get 5 EVs, in this case, speed EVs. That will still mean you will need to do 51 battles, which is still a lot. With your power items you will now get 5 EVs for a single zubat, meaning 25 speed EVs for a single Horde Battle. Now you only need to do 11 Horde Battles to get a max EVs. Having Pokerus will also double the EV gain from a Pokemon, so instead of just 5 speed EVs from a Zubat, you will get 10! That now means I will gain 50 speed EVs from a Zubat horde, meaning that I will only need to do 6 battles. 5 battles to get the EV stat to 250 and then the 6th to get those extra two. Search for the horde that gives the desired EVs - I would recommend using this guide here(provided by Valkyros.). My Wooper wants a max HP stat, so I will go to route 5, where hordes of Gulpin are frequent. Use Sweet Scent to start a Horde Battle - If you don't meet the horde you want, just keep running, as battling them will mess up your EV gain. Use your area of effect moves - My Wooper can learn surf, so I taught him it so I can use him in the battle, allowing him to gain the most EXP. points too. Repeat until you reach max EVs - if everything has been done correctly, I should only need to do 6 Horde Battles to get a max HP stat. Once you've done that you can move to your next horde and repeat the steps to get another maximum EV stat. My Wooper also wants a max defense stat, so I will give it a Power Band and will battle Nosepass hordes on Route 10. Now there isn't really much to say about this method as it's all explained in the game itself. Each level will increase your stats by a certain value. Level 1 will increase your EVs in the stat you trained by 4, level 2 will increase EVs by 8 and then level 3 will increase your EVs by 12. If you are unhappy with your EV stats you can punch the black punching bag on the Super Training screen until you get a white punching bag, which will reset all of your EVs to zero. This can be done for the other EV training method too. It should be noted that you won't need Pokerus or the Power Items for this method. So now the second hardest part is over! It's really not that bad, once you've gotten used to it you'll be ready for building your team in no time! 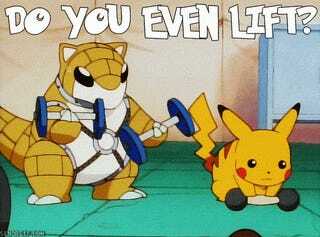 Especially if you have multiple Power Items, you can EV train 6 Pokemon at a time. Just make sure the EXP. Share is on and they all have Pokerus. If anyone needs some Pokerus I'll happily provide it. Similar to IVs, not all Pokemon need max EVs in a single stat, some may benefit from having some EVs in every stat. That's another story for another time though. Next article I will be going over the basics of team building.